NO - not me !!! 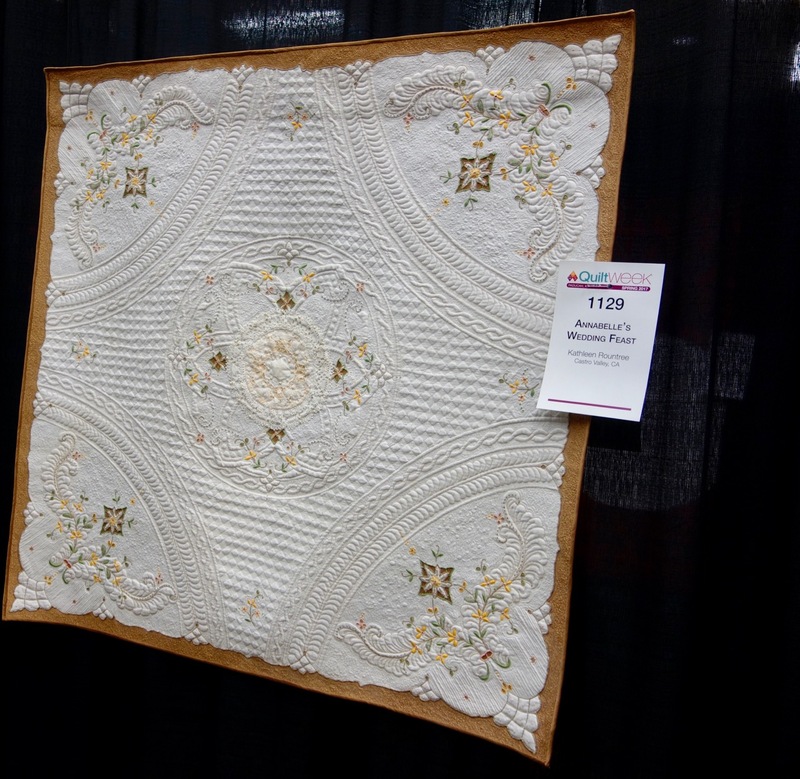 One of my quilts - remember this one, it's called "Annabelle's Wedding Feast"
Annabelle was just accepted into the Mancuso Lancaster Show - they are having a "throwback" competition, meaning you can enter quilts made over a wider time span than the usual three years. so, Annabelle gets another chance to travel !!! She thought she was retired - - ha ha. Lots of people ask how i did the center of the quilt - so I'll let you in on the secret. When I first made the quilt, I stitched a quilted medallion in the middle - and it just wasn't good. It looked awful. 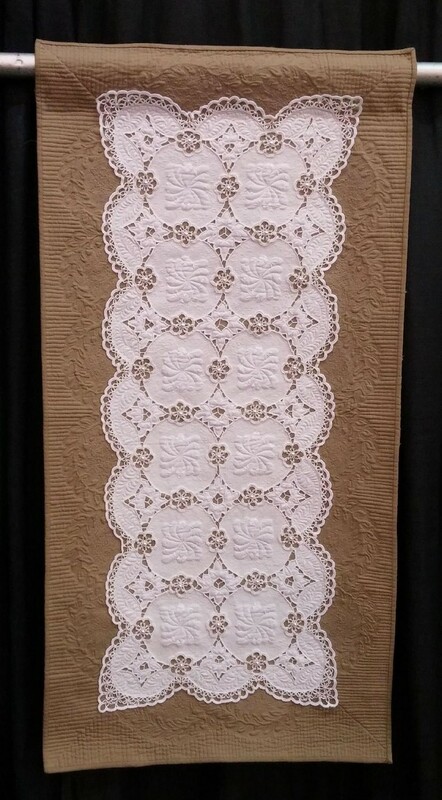 So I put the quilt aside for a year, waiting for an idea......... finally, I remembered something my quilting mentor, Cindy Needham had done - add some special vintage lace or a doily - - and voila ! So how did it get to be that lovely peach color, you ask ? Well, there are three doilies. The bottom one is the biggest, and the outside ring of lace is all you see of that one. The second doily, on top of that, is smaller, and is a peach color. Then the third one goes on top, and provides the lovely lattice look with the peach peaking through ! Annabelle is very excited to go to Lancaster - after all, every quilts thinks Lancaster is their Mecca, don't you think ??? Well, it's been a while since I posted............... and here I am, with the same quilt I posted about six months ago...............FINALLY FINISHED !!! a Judge's Choice ribbon from the Mid-Atlantic Quilt Festival in Virginia ! Oh I am always so touched when a judge picks MY work as their personal favorite.......... thank you, judge Bobbi Bergquist !!! 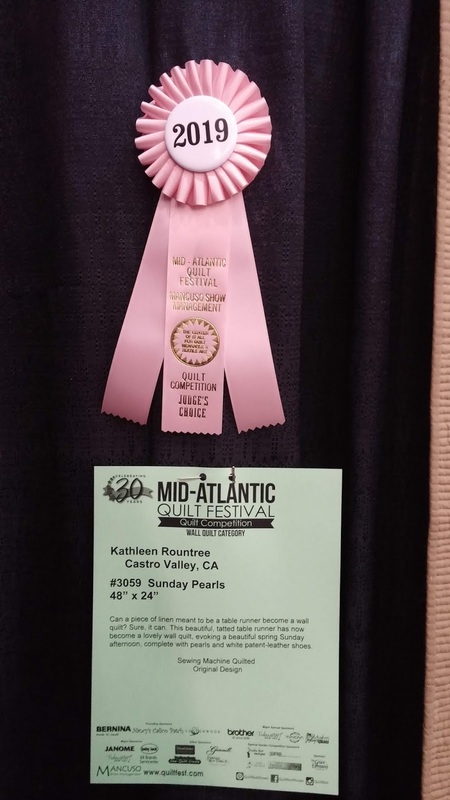 A lovely and generous quilter I met on the internet was going to the show and took this wonderful photo of my ribbon, and of the quilt hanging in the show . Thank you, Constance !!! I named it Sunday Pearls, because it made me think of crisp white linen, patent leather shoes, and a single pearl necklace, all dressed up for Sunday church. I am such a happy quilter !!! Progress ?? Yes...... This tatted linen runner is now bound, the edges are finished, and I am just working on the details - some machine work still to go as well as more beading. Moving forward, one stitch, one bead at a time ! 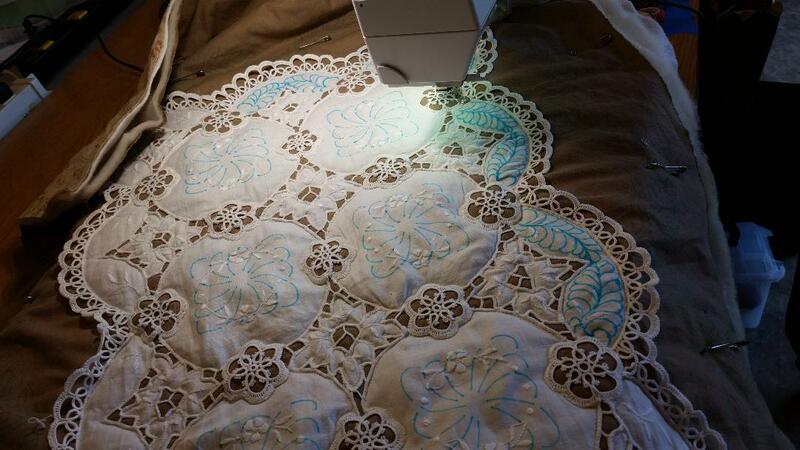 This tatted linen piece is turning out to be lots of fun to sew on... I love the contrast of the crisp white with the nice taupe linen. I put some lovely feathers in the arc shapes down the edge and around the corners. Now I'm working on a nice design to go in the center of each circle. An antique milk-glass button will go in the center of each of these designs. AND - since I just must have something bright and fun going at the same time... a round robin i am doing with some quilty friends. A friend started the bottom row, and i added the flying geese. WHY? I have no idea........... because I can, I suppose. This is only ONE of the fun things going on in my life right now. I am proclaiming a "new start". New goals............ new activities........... new ... well, LOTS OF NEW. But for today, just a new piece - and I'll show more details soon. This work was begun about 2 years ago - and thee beads turned out to take WAY longer than expected !!! Oh my aching back I am glad it is done .